French Impressionist painter, mainly of women, children and landscapes. Born at Limoges, son of a tailor. Lived in Paris from the age of four. Apprenticed to a painter of porcelain, then earned money to study art by painting blinds, murals, etc. In 1862 entered the Ecole des Beaux-Arts, in the studio of Gleyre; met Monet, Bazille, Sisley. Influenced by Courbet and made painting expeditions to the Forest of Fontainebleau. 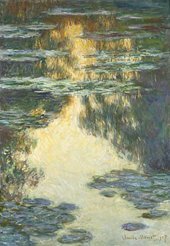 About 1869-74 painted much with Monet along the Seine near Paris; they adopted a higher-keyed palette and between them evolved the characteristic Impressionist idiom. Exhibited at four of the Impressionist exhibitions 1874-82, and had his first one-man exhibition at La Vie Moderne, Paris, in 1879. After visiting Italy in 1881, where he was impressed by Raphael and Pompeian frescoes, and later working with Cézanne in Provence, turned away from Impressionism and adopted a more precise style of drawing related to Ingres and Boucher. Took a house at Essoyes in 1898. From 1903 regularly passed the winters at Cagnes and the summers at Essoyes. His late works were hotter in colour and more rounded in modelling. In his last years, though increasingly crippled with arthritis, he began to make sculpture with the help of an assistant. Died at Cagnes. Pierre-Auguste Renoir, commonly known as Auguste Renoir (; French: [pjɛʁ oɡyst ʁənwaʁ]; 25 February 1841 – 3 December 1919), was a French artist who was a leading painter in the development of the Impressionist style. As a celebrator of beauty and especially feminine sensuality, it has been said that "Renoir is the final representative of a tradition which runs directly from Rubens to Watteau." He was the father of actor Pierre Renoir (1885–1952), filmmaker Jean Renoir (1894–1979) and ceramic artist Claude Renoir (1901–1969). He was the grandfather of the filmmaker Claude Renoir (1913–1993), son of Pierre.